The anti-cuts struggle in Birmingham moved up another notch on Saturday with a very successful city centre demonstration. It was organised by Birmingham against the Cuts; a collective of Trades Unions, Political organisations, Campaign and Community groups, initiated by Birmingham Trades Union Council. Over a 1000 demonstrators representing a variety of organisations, anti-cuts groups and trades unions gathered in the grounds of Saint Phillips Cathedral, with more joining as the march gathered pace. Despite earlier wet weather, this turn out was extremely good. Many were taking part in their first ever demonstration and this gave a very refreshing atmosphere with a lively and noisy procession through the streets. We are grateful to the Bishop for allowing us to use the Cathedral Square to gather, but less than grateful to the Council who wanted to restrict our march to a few back streets; platitudes in favour of democracy in the Middle East from Cameron were not matched by Tory practice in Birmingham! This was more restrictive than the police view. However, the march set off in high spirits along a short route, but one which did go through the city centre shopping area. The reception from shoppers in High Street and New Street was enthusiastic. As the march went along New Street, activists from UK Uncut staged an impromptu blockade of tax-dodgers Barclays Bank on the High Street and Burtons (another of Phillip Green’s enterprises) & Vodafone on New Street . This kind of street theatre played an important role in getting the message across that there is an alternative to the cuts, and it lies with making the fat-cat corporations and the banks pay. It also generated considerable public sympathy. On the march there were contingents and banners from Save Birmingham Youth Service (CYWU-UNITE), Social Work Action Group, Women2gether, Friends of Moseley Baths, Campaign to Retain our School Service (CROSS), Connexions, the Green Party, the Labour Party, the Right to Work Campaign, the People’s Charter, the Clarion Singers (who wrote a song especially for the occasion), the Alliance against Birmingham Academies,, GMB, UNISON, CPS, UNITE, CWU, UCU, and the NUT. 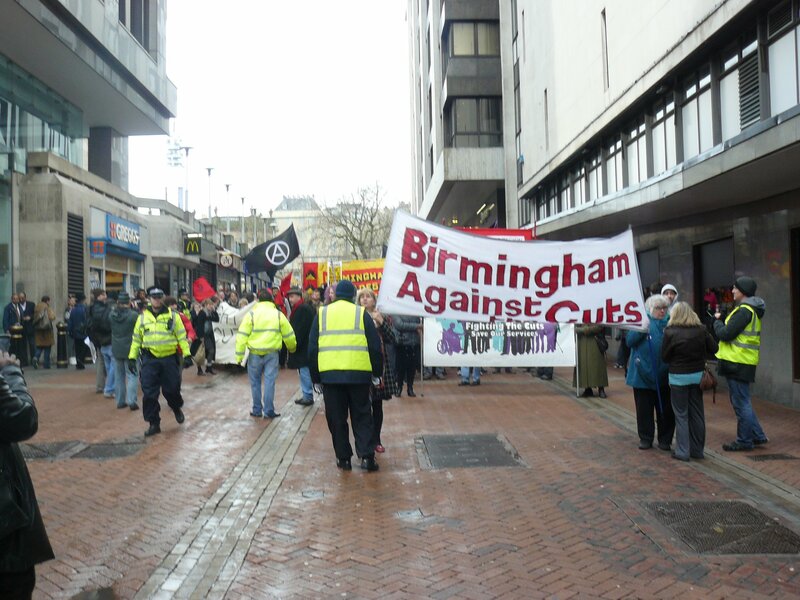 The march was led by contingents from Birmingham against the Cuts and Birmingham Trades Union Council. There were speakers at the start and end of the march; Lee Barron (the regional secretary of the CWU and the new chair of West Midlands TUC, Trudy Allen (PCS), Roger Jenkins (GMB), Grahame Horn (Birmingham UNISON), James Smith (UCU), Roger Mackenzie (West Midlands UNISON), Bob Williams-Findlay from Disabled People against Cuts, Stuart Richardson (Birmingham TUC), Doug Morgan (Birmingham NUT), Caroline Johnson (Birmingham Against the Cuts), Albert Bore – the Council Labour Leader, Andy Chaffer (People’s Charter), Maxie Hayle – Black People Rising Against the Cuts, Matt Raine from the Right to Work Campaign, Doug Morgan (NUT), FE student activist Tom Maguire-Wright and Joyce Canaan – UCU and BCU Against Cuts and Fees. 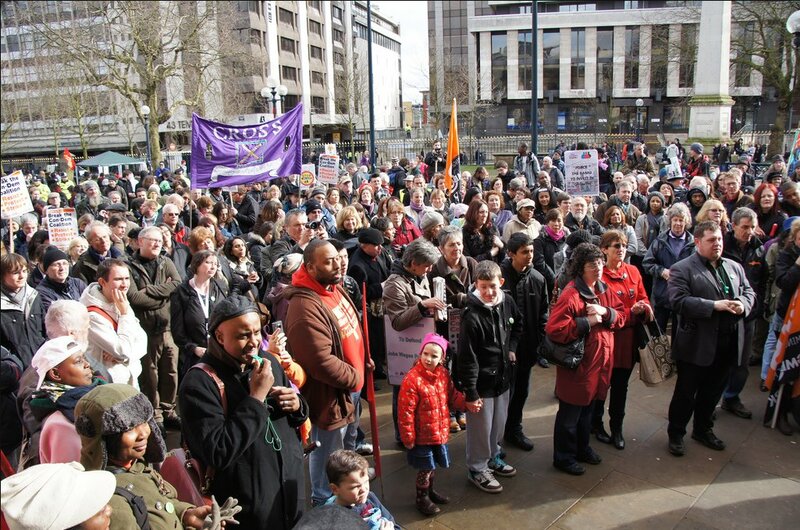 The rally was chaired by UNISON Birmingham’s Joint Secretary Caroline Johnson. Considerable media coverage was generated, including interviews with Bob Williams-Findlay, on behalf of Disabled People against Cuts and Stuart Richardson, on behalf of Birmingham Trades Union Council. Overall, the demonstration counts as another big success for Birmingham against the Cuts, after an impressive public meeting the previous week at the Council House. It shows once again what can be done when the left, the unions and campaign groups work together with an inclusive and democratic spirit. Tomorrow from 2pm-6pm Birmingham City Council holds the full council meeting where the budget will be voted on. 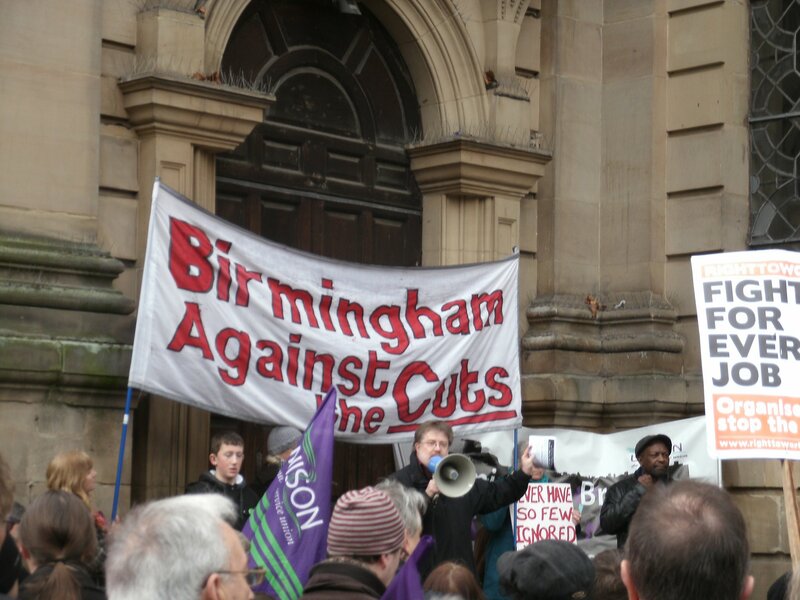 Unison and Birmingham Against the Cuts will be holding a demonstration outside the council house at the same time. Come and join us – if you can’t make the afternoon the demonstration will go on until at least 6pm. Job Losses – 2,450 council posts will be cut this year (7,000 over 3 years) and 5,000 posts privatised (making it easier to cut funding in the future). Birmingham already has an unemployment rate twice the national average and cannot afford to lose thousands more jobs. Adult Care Services – 11,000 people who currently receive care having been assessed as having “substantial” care needs will no longer be eligible for home care, day care or residential care and will lose their care services. Overall, more than £33million will be cut from Adult Care Services, affecting older people, those with learning and physical disabilities and people with mental health problems. Youth Services – £3m will be cut from Birmingham Youth Services budgets. Such a cut would close over 40 youth projects (more than 2/3rds) across the city and deprive young people and communities’ easy access to trained and qualified youth workers. Heart of England PCT – 1,600 jobs to go, affecting NHS services in this city, and this is only 1 of 5 PCT’s to serve Birmingham so there will probably be more job losses to come. At least 4,000 NHS Jobs will be lost across the West Midlands. Neighbourhood Office and CAB closures – CAB has been temporarily saved but neighbourhood offices are still under threat. Both of these provide vital and free advice on financial, legal & housing problems and council services. As unemployment rises, these services will become more important. £10 million cuts in Children’s Social Care, affecting “looked after” children, some of the most vulnerable children in the city. £1.3 million cuts in library services, £1 million cuts in grants to arts and £1.25 million cuts in funding for Museums with entry charges “almost decided”. Ikon Eastside will be closing and this will probably just be the first of many cultural venues in Birmingham to shut down. Pay Cuts and terms and conditions reviews for 26,000 council staff including refuse workers who have already been on strike. Community Safety Partnership – £1.6m less spending on, and reduction in funding for West Midlands Police Force (2,200 jobs to be lost, including 600 officers) will see rising crime. The demonstration meets at 12 noon, Birmingham Cathedral and will march around the city centre before reconvening at the Cathedral for a rally, at which the Bishop of Birmingham will address the city, along with speakers from CWU, PCS, UCU and Unison trade unions, Bob Williams-Findlay from Disabled People Against the Cuts and Caroline Johnson from Birmingham Against the Cuts. On Tuesday, from 2pm-6pm there will be a demonstration outside Birmingham City Council house in Victoria Square, whilst the council meets to vote on the budget. During the budget meeting Cllr Salma Yaqoob will present a petition to the chamber from the people of Birmingham calling for councillors to vote against the budget that will have such a detrimental effect on so many citizens of Birmingham. Over the past few days and weeks many councils across the UK have met to vote on budget cuts, and there have been strong demonstrations at all of them. Some councils have decided to close their public gallery, removing the right of citizens to observe and partake in the democratic process, and there have even been arrests at a couple of meetings. Closing the gallery has led to occupations of council chambers in Brixton, Leeds and Haringey and impromptu peoples’ assemblies which have discussed the impact of council cuts on local people. There is a rising mood against cuts in the UK which Birmingham will be part of on Saturday and Tuesday. Join Us. 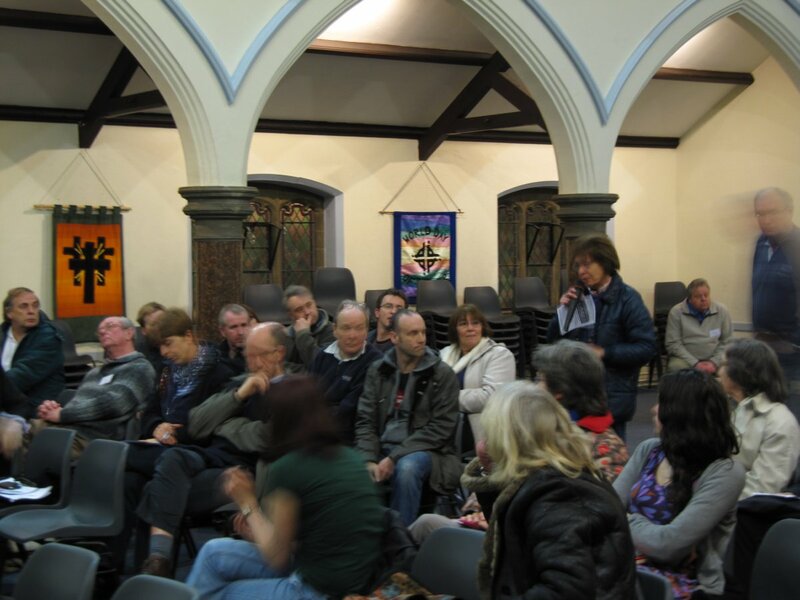 Yesterday, 42 people attended a meeting organised by Stirchley and Cotteridge against the cuts, to hear the administrator of Cotteridge Church day centre and the steward at the local neighbourhood office talk about how the Birmingham Con-Dem council’s plans will hit some of the city’s most vulnerable people. Also in attendance were Labour MP Steve McCabe and Tory councillor Nigel Dawkins. The day centre administrator said: “this day centre is the only 5 day a week preventative service within a 5 mile radius” and she explained how, despite the fact they’ve been the heart of a community for 25 years, the council wrote them and other day centres a letter saying that the £64k grant, which is peanuts for a council the size of Birmingham, will be withdrawn in April. Due to a massive outcry and coverage in the Birmingham Mail the service has now been offered a “bridging grant” for April to September, however the size of this grant is unknown and come September they will need to apply for further funding from a smaller pot of money. The future remains uncertain, which is why the campaign continues. This means the closure of local offices and their merging and replacement with “super offices” covering bigger and bigger areas of the city, based on promises of future funding yet to materialise. These are closures and cuts not upgrades, which is why neighbourhood office staff voted 130/1 last Thursday to ballot for strike. Dawkins tried to hide behind the argument that these are “difficult times”, that the reductions are “not of our own making” and it is his “duty” to vote for the cuts. He even tried to sell the cuts to neighbourhood offices as “an improvement”. He had clearly turned up at the wrong meeting. 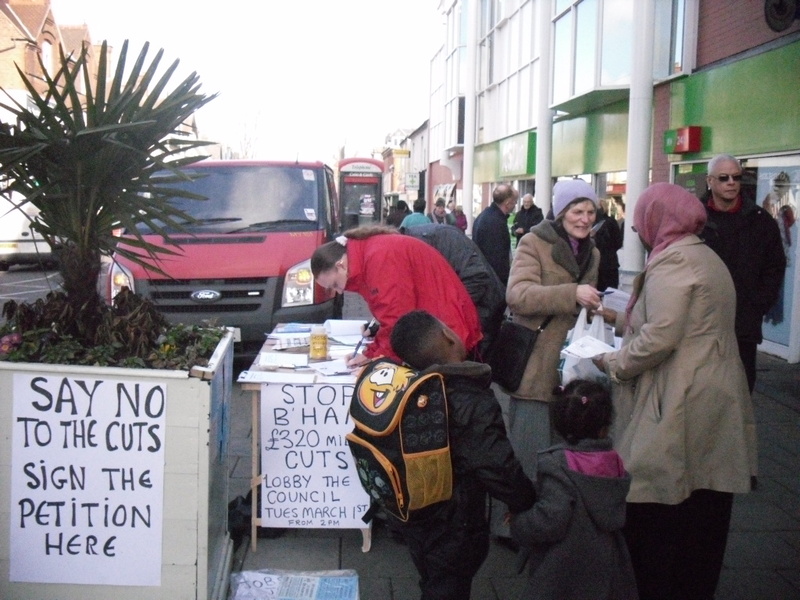 Feelings started to run very high as people felt the councillors had no mandate for the cuts. Dawkins was asked why he had come at all, if he felt he had no choice but to vote for the cuts. When Dawkins said it wasn’t his decision but was up to the cabinet member (also a Tory), people called on him to “do the right thing” and resign, saying “you either take our views to the council or you’re not doing your job properly”. McCabe did not engage with the issue of neighbourhood offices, but he did agree to sign up to a statement drafted by the day centre stating that it is a vital service which must not be closed. The meeting has raised the stakes for local politicians, who now know that whenever a cut is announced local people will be ready to campaign to stop it. The Con-Dem goverment has already shown they are vulnerable to U-turns when it comes to forests, housing benefit and debt advice. The same should apply to their poodles in Birmingham. The meeting resolved to continue the pressure and to attend the anti cuts protest in Birmingham this Saturday and at the budget setting meeting on March 1st. Birmingham Against the Cuts and Unison have announced speakers for the rally as part of the Say No To Council Cuts demonstration to be held on Saturday. The demonstration assembles at 12 noon, at Birmingham Cathedral, St. Philips Place, Birmingham. There will be a march around the city centre followed by a rally back at the Cathedral. This demonstration will call for councillors to vote against cuts at the council meeting on 1st March. The planned cuts will see £212m slashed from the council budgets this year, at the cost of 2,450 jobs and many services, such as adult care services and youth centres. And most importantly, come along on Saturday and Tuesday to make sure councillors know that Birmingham does not support these cuts, does not think that redundancies will help a city with high unemployment, and is not happy to see vital services to the people of Birmingham being closed or reduced. It’s a busy week next week, with something happening pretty much everyday somewhere in Birmingham. On Wed 23rd in the afternoon, EAN (Education Activist Network) have a Half term protest. Facebook event Meet at Waterstones/Bullring 1pm to protest cuts in education. 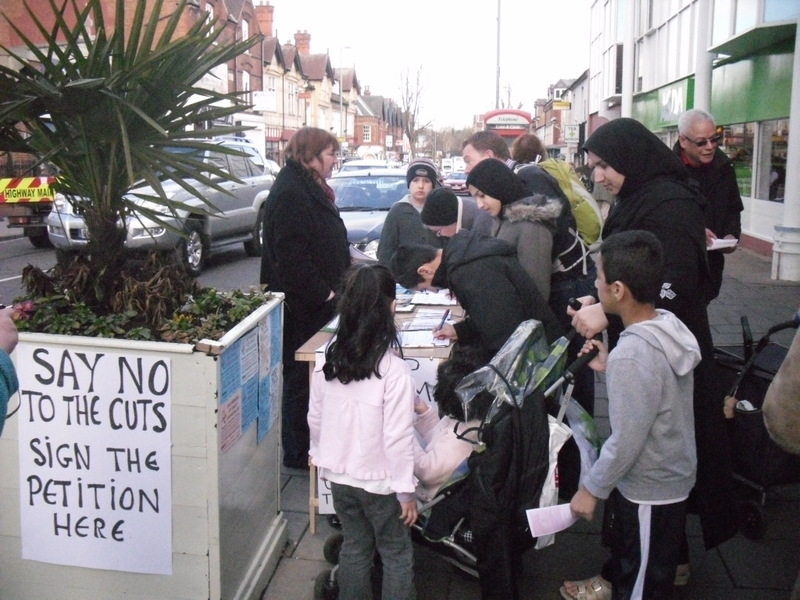 And in the evening, Stirchley and Cotteridge against the cuts are hosting a public meeting. 19:30 Cotteridge church, Cotteridge island, pershore road. Cotteridge church day centre facing closure, and neighbourhood offices are also under threat. On Thurs 24th, at 12:30pm – BCU protest against cuts of 78% at the uni will take place outside Kenrick library at city north campus, as part of a national day of action against education cuts. Later on, at 19:30 Dudley Coalition Against the Cuts host a public meeting,at Brierley Hill Civic Hall Facebook Event Speakers: Mark Serwotka + speakers from Unison, FBU, NUT and local campaigns. 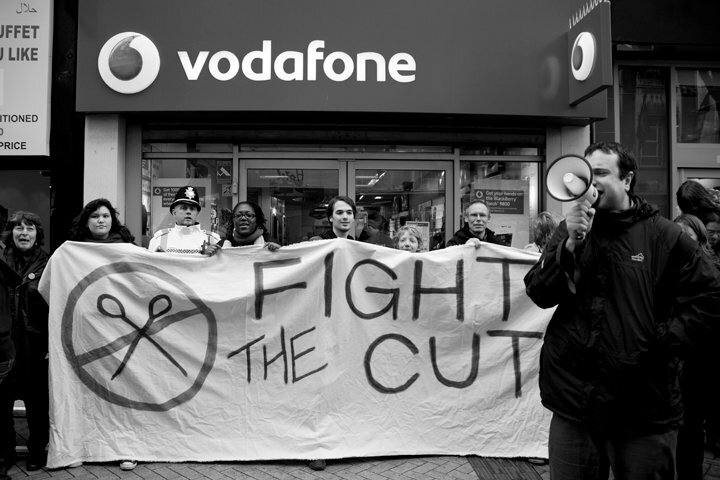 Saturday 26th February: March Against the Cuts, Birmingham City Centre. Birmingham Against the Cuts, Unison, NUT, CWU and anyone else who wants to demonstrate against council cuts. With nearly 2,500 job cuts being threatened in the next year and 7,000 over 3 years, and the possibility of strike actions by council workers, this should be a well attended demonstration, and we would love everyone to come out to it – more speakers are waiting to be confirmed. And although I know it’s not strictly this week, on Tuesday 1st March, a Unison led demonstration at the Council House will take place from 2pm, as the council meet to vote on the budget – Salma Yaqoob will present Birmingham Against the Cuts petition to the meeting – you can add your signature online here or at the event on Saturday 26th. This demonstration will continue into the evening, so you can join it after work. Stalls were held today in the city centre and Kings Heath campaigning about the upcoming council cuts which will mean the loss of over 7,000 jobs over the next 3 years, and the reduction or closure of many services, such as CAB and adult care services. 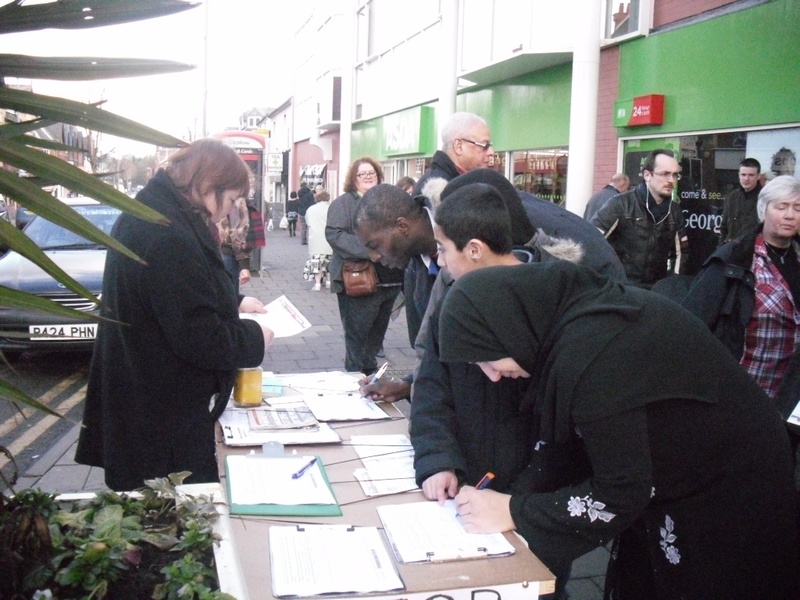 There was a lot of interest at both locations, with hundreds of people signing the petition, and saying they will attend the events coming up to demonstrate against council cuts. On 17th Feb there will be a public meeting 19:30pm and the council house. On 26th Feb, there will be a demonstration, march and rally, assembling at 12 noon at Birmingham Cathedral. On 1st Mar, there will be a demonstration outside the council house from 2pm, as the council meet to set budgets for the following year. There are also other events happening around Birmingham in the next few weeks. 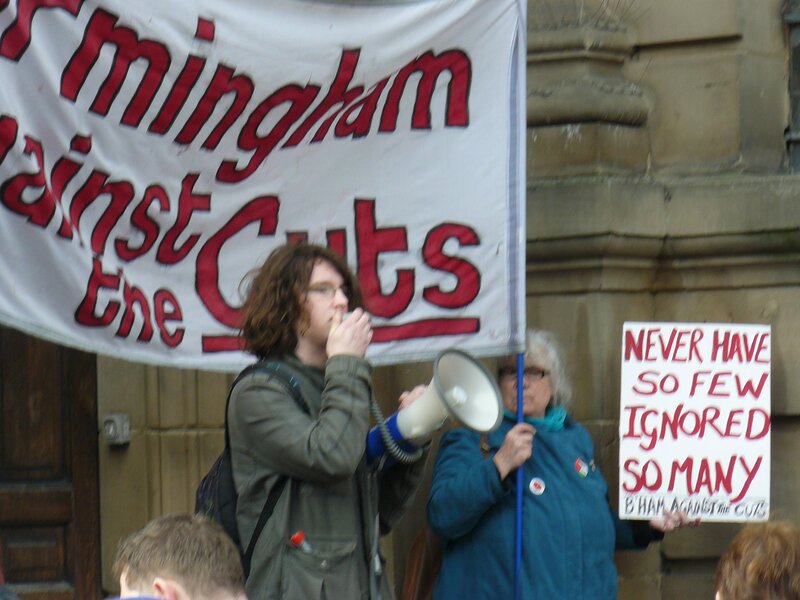 The next planning meetings for Birmingham Against the Cuts are on Monday 14th and Tuesday 22nd Feb. These will be focused on the meeting and demonstrations coming up. Everyone is welcome to attend. For more details on any of these, see the upcoming actions page on our blog.